Aspirants who are looking for Jobs in Reliance Jio must be ready to apply for Reliance Jio Off Campus 2018 that has been issued recently. In order to fill various vacancies of Sales and Distribution, Human Resources & Training and many more by the way of online are invited. Candidates are hereby notified that company is looking for Graduate who have BE / B.Tech / BCA / B.Sc / M.Tech / M.Com Degree for Reliance Jio Job Openings for Freshers. 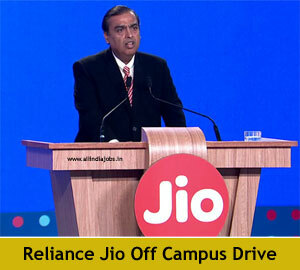 In this concern, the company is going to conduct Reliance Jio Off Campus Drive 2018. Willing candidates can submit application forms by visiting the Registration Link which is well available in this article. To gather other details about Reliance Jio Off Campus 2018, have a look on below section and stay tuned page which is well modified by team All India Jobs. You can also check other Freshers Jobs in India. Are you going to apply for Reliance Jio Off Campus 2018? Yes!! Have you check the educational qualification, eligibility criteria and Selection process and other details? Not yet! Then, have a look!! Candidates who are going to appear for Reliance Jio Vacancy, they should have mentioned graduation with good academic records. Individuals should have relevant working experience along with excellent communication skills. Age of applying candidates should be according to the rules of the company. To help you crack the interview process, we have collected latest Reliance Jio placement papers and Reliance Jio interview questions. Practice hard to get placed in Reliance Jio Off Campus 2018. BE/ B. Tech (Computer Science / Information Technology / Electronics & Telecommunications / Automobile / Electrical / Electronics / Electronics & Communication / Electronics & Electricals / Information Science / Information Technology / Instrumentation / Mechanical / Mechatronics). Learn and Execute roles of selected business function. Provide technical assistance related to business process, app, connectivity & others. Candidates must have a minimum aggregate of 60% from SSC Onwards. The minimum age gap of 1-year is allowed in education. The aspirant should not have lost any academic year certificate due to having failed in any course or subject ever for whatsoever reason. Who are interested in working with Reliance Jio they don’t have any pending backlogs. It is mandatory to each and every candidate to clear backlogs at the time of appearing for Reliance Jio Off Campus Selection Process. Reliance Jio organization will shortlist the candidates based on their performance in the interview. Below mentioned selection rounds will be organized for select the capable contenders. Contenders shortlisted for Reliance Jio Off Campus Drive will get the salary, grade pay and all other additional benefits as per company norms. In this section, we are providing the suggestions to crack Reliance Jio Off Campus Drive. We have uploaded Reliance Jio Placement Papers and Syllabus for candidates better preparation. Have a look on Reliance Jio Test Pattern and refer it before going to interview. Eligible and interested candidates can apply for Reliance Jio Off Campus Drive as early as possible by the above provided link. We hope the Reliance Jio Recruitment data is helpful for applicants. In this article, candidates can get an essential information about jobs throughout India. Reliance Jio Off Campus Drive | Jio Recruitment 2017 For Graduate Engineer Trainee Vacancies. 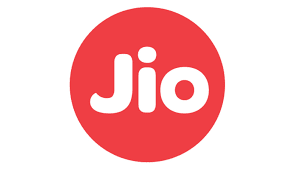 Graduate Engineer Trainee Jobs in Reliance Jio – Gurgaon. Reliance Jio has multiple vacant positions for BE students for Graduate Engineer Trainee posts. Interested and Eligible Candidates practice Reliance Jio Placement Papers before attending the Interview so that you can ace the test easily. Candidates who want to build their career in an appropriate manner they can grab the chance and enhance their career. Reliance Jio Infocomm Limited has specified that they will hire the candidate’s who have the ability to substitute for the selected function on a medium, long term as well as Learn and execute the roles of selected business function, Contribute first as a support player, then as an individual to the respective business role. As we all know compared to the previous year competition for Jobs had increased immensely. So there will be tough competition for this Recruitment. Candidates are advised to check Reliance Jio Test Pattern so that they can prepare confidently and can easily crack the Recruitment of Reliance Jio Recruitment 2017. To know more updates about Off Campus Drives, IT Walkins, Recruitments in Gurgaon keep on checking All India Jobs for regular fresh updates. Ability to substitute for the selected function on a medium, long term. Reliance Jio Infocomm Limited, or Jio, is an LTE mobile network operator in India. It is a wholly owned subsidiary of Reliance Industries headquartered in Navi Mumbai, Maharashtra that provides wireless 4G LTE service network (without 2G/3G based services) and is the only ‘VoLTE-only’ (Voice over LTE) operator in the country which lacks legacy network support of 2G and 3G, with coverage across all 22 telecom circles in India. The services were first beta>were commercially launched on 5 September 2016. Reliance Jio will select the candidates by conducting the following three rounds. Candidates who will perform well in the GD those contenders are eligible to attend for the Technical Interview followed by Technical + HR (Skype interview). In Group Discussion – topics are from indabix. In Technical Interview – questions are from your Resume, Projects, About your Phone, Cloud Computing. In Technical + HR – (Skype interview) – Again questions are from your Resume. Interested Job aspirants can apply for Reliance Jio Recruitment 2017 for Graduate Engineer Trainee Positions in Gurgaon. Contenders who are going to appear for Reliance Jio Interview they can check the mandatory details which are provided in this article. Aspirants who are interested in working with Reliance Jio can apply for Reliance Off Campus Drive for Graduate Engineer Trainee Vacancies as soon as possible through online mode. Applicants who are located in Gurgaon can grab this chance to enhance better future.